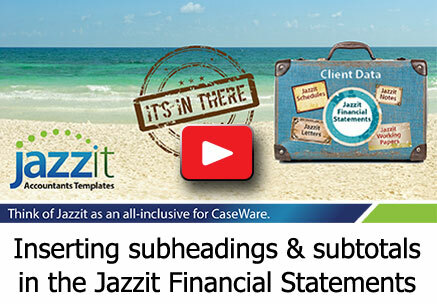 The ability to add subheadings and subtotals within your Jazzit Financials provides you with greater flexibility when looking to add sub-groups within sections. For example, you can now add a subtotal to the administrative and selling expenses within the expense area of the income statement. You might also wish to show subtotals for revenues from different operations within the revenue section. Subtotals can even be later moved to include or exclude items within the section. The subheadings and subtotals are available for the balance sheet, income statement, and statement of cash flow for both the default (2 year) and 9 column statements. 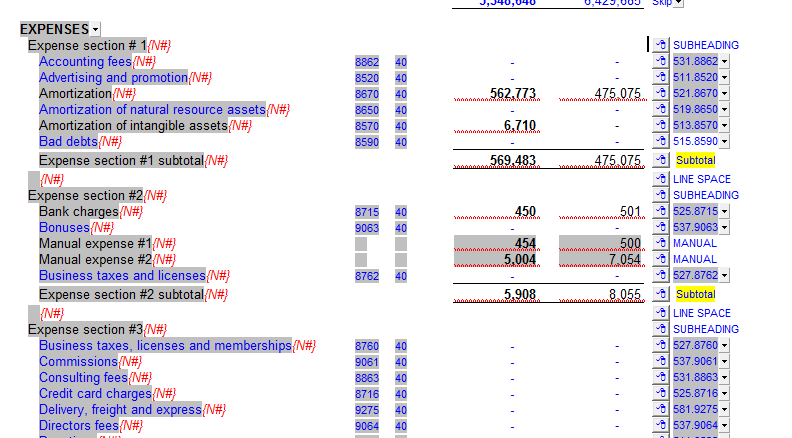 In this example, three sections were created within the expense section of the income statement using a combination of subtotals, subheadings and line spaces. To insert a subtotal or subheading, right-click on the express button and select the appropriate option. Also, the section headings (ex: expenses) can be right-clicked to produce the same options. This is useful for inserting a subheading or subtotal as the first line in a section. When more than one subtotal is inserted in a section (ex: COGS) the template will automatically produce an underline beneath each subtotal. Sometimes this will create a “double-underline” at the bottom of a section. 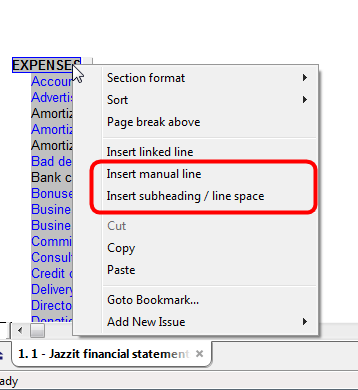 Right-click on the express button on the subtotal line and select the “Underline below subtotal” option to remove the underline. Underlines can be removed for any subtotal. Subtotals will automatically recalculate their amounts when lines are sorted above or below them. 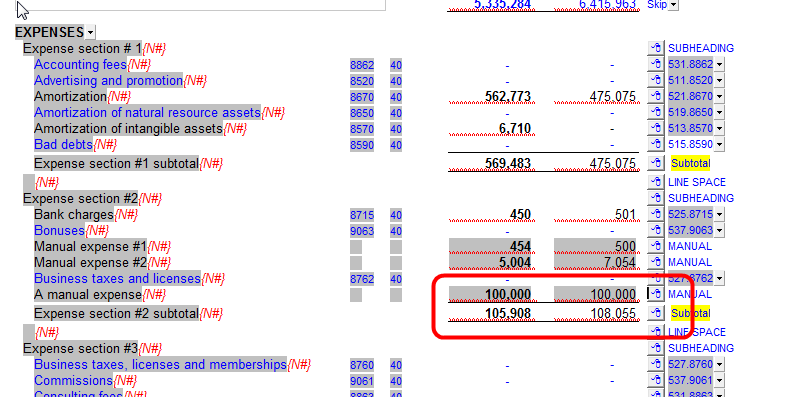 In the example below, the 100k expense is sorted above the #2 subtotal. The #2 subtotal increases its amount by 100k in response. When using automatic sorting (alphabetical, ascending, descending) subtotals and subheadings will be unaffected and remain in place.